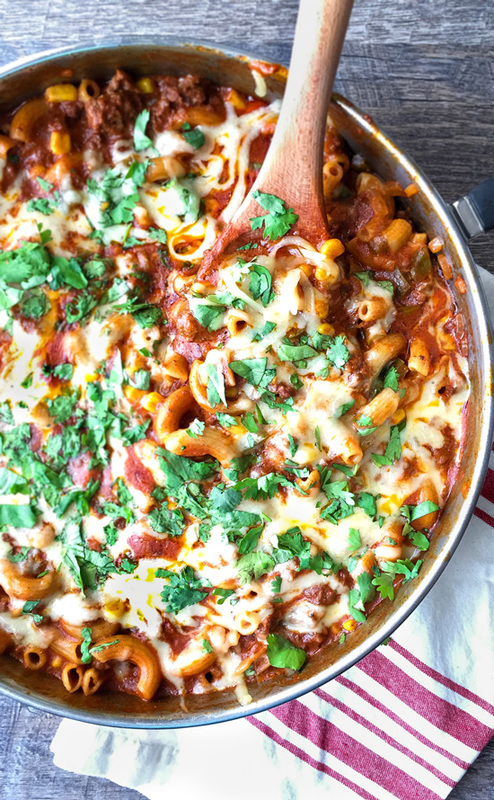 This One Pot Taco Pasta is packed full of flavor! 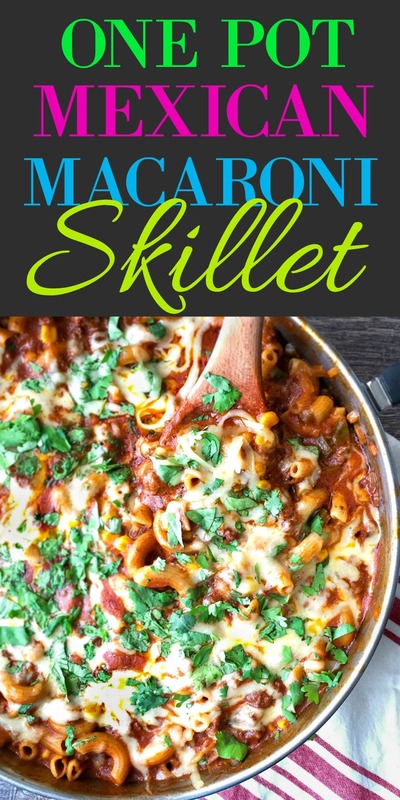 It combines lean ground beef, peppers, Mexican seasonings, and pasta that gets perfectly cooked all in one skillet! Who doesn’t love a delicious one-pot meal? And this cheesy Taco Pasta can be on your table in about 35-40 minutes! That makes it a great option for a weeknight comfort food meal! So much better than that box of Helper! I recommend the Jovial Foods brand of brown rice pasta if you need a gluten-free option. It holds up better in preparations like this better than some of the other brands I’ve tried. If you are looking for a great regular pasta brand, I really like the Montebello Organic Pasta. The texture and taste of their pasta is seriously good. 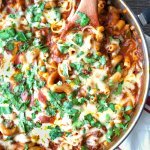 This cheesy Taco Pasta combines lean ground beef, Mexican seasonings, and pasta that gets perfectly cooked all in one pot! Heat oil in a 10.5-inch skillet that has a lid over medium-high heat. Add ground beef, breaking it up with a spoon as it browns, about 5-6 minutes. Add the onion and bell pepper when almost no pink remains. Continue to cook until vegetables have softened, about 5 minutes. Stir in the chili powder, garlic powder and cumin until meat and vegetables are fully coated. Stir in water, tomato sauce and pasta. Reduce heat, cover and let cook, stirring occasionally, until pasta is tender, about 15-20 minutes. Cook time may vary depending on brand of pasta, so check for doneness often starting at the 15 minute mark. Turn off the heat. Add the corn and one cup of the cheese, season to taste with sea salt, and gently stir to combine. Top with remaining cheese and cilantro, then serve. The heat level of chili powders can vary, so you may want to adjust accordingly. Just use your own best judgment. If you are using ground beef with a higher fat, you will need to drain the fat after cooking the meat.